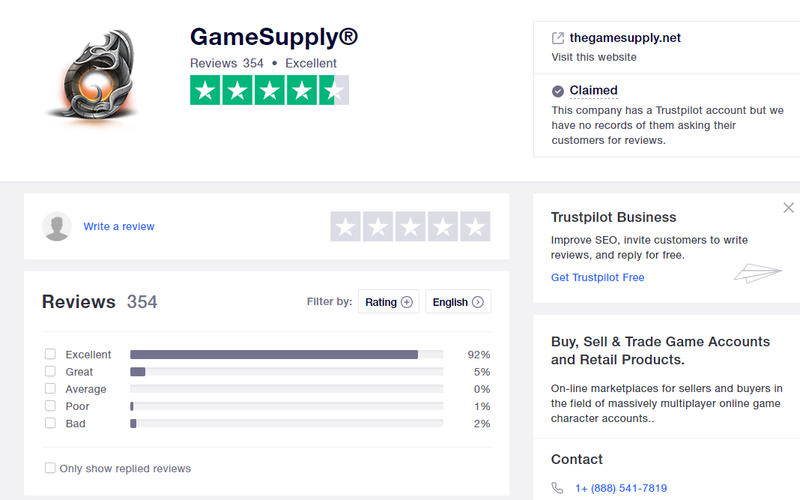 It seems as though g2g(dot)com has been putting fake feedback on our Trustpilot site trying to bring our rating down. So, a few words about these short lived auction sites like g2g. There is a very large difference between buying accounts from a site like ours or Accountwarehouse, Khaccounts etc. We BUY the accounts directly -- We PAY for them directly to the seller and fully verify each and every purchase. So, if an account is lost to fraudulent activity, it's our funds that are lost because we offer you as a consumer a warranty on your purchase. Yes, we are direct competitors with accountwarehouse and khaccounts but we've all been in business buying and selling accounts for over a decade and people keep coming back to us because they don't have issues. The "auction" style sites like g2g or playerauctions will NEVER have the level of security we have. Mainly because they do not BUY anything they are merely a platform for others to list products on. Even if you do not purchase @GameSupply® do yourself a favor and avoid g2g and playerauctions.